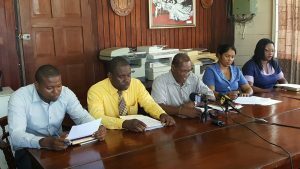 The Guyana Public Service Union (GPSU) on Wednesday said its countrywide leadership would next week decide on the way forward because government has failed to keep its promise to continue wage and salary negotiations. “If we can’t agree here, let’s follow the process. We have conciliation, we have arbitration and let the arbitrators decide. If they say they can’t reach it we’ll accept. The arbitrators’ decision is final but don’t just arbitrarily say we can’t do it and that’s it,” GPSU Vice President Mortimer Livan told a news conference. Calling the recent one-off tax free GYD$25,000 bonus for government employees earning up to GYD$500,000 monthly a “Christmas freck”, Livan accused the Ministry of Finance and the Ministry of the Presidency’s Department of the Public Service of frustrating commitments by President David Granger that the recent one to 10 percent salary increase was an interim payout and that negotiations would continue. “We are faced now with delaying tactics,” Livan said, adding that they could have found the time to agree on the bonus but could not find time to return to the bargaining table. The two sides last met on September 15, 2016 shortly after the Guyanese leader had said that the one percent to 10 percent pay hike was the all the government could have afforded. Livan said the Executive Council would meet next week to decide on the way forward, even as he acknowledged that the 2016 wage and salary talks could continue next year as part of negotiations for 2017 and 2018. The union wants public servants to eventually be paid a minimum salary GYD$130,000. In light of Granger’s assurances that the negotiations are incomplete, the GPSU had suspended moves towards conciliation and possibly arbitration, but now it appears that the union is determined to invoke the other steps in dispute settlement. “Frankly, the union finds the meagre ‘Christmas freck’ guesture- not least the Finance Minister’s quixotic and decidedly indelicate remark that the paltry sum will help ‘ease the journey to the good life’ to be both trite and insensitive,” the GPSU said.